At Gold Disposal, waste and junk removal is one of our primary services. We handle all kinds of waste, from all kinds of sources, including residential, commercial and industrial. From our facility in North York, we operate 7 days a week and service the entire Greater Toronto Area, as well as the communities throughout southwestern Ontario. Our services are designed to be reliable and consistent, and above all, as stress-free as possible for the customer. Whether you require specific disposal services, or a more all-inclusive approach, we can do it for you at a competitive price. We provide a straightforward quotation (no-obligation) on the scope of the job, and even offer online quotes for your convenience. In fact, an entire project can be quoted, booked and confirmed online. Most importantly, you can be certain that Gold Disposal will service you from the minute we quote to the minute we pick up. If you’re booking for waste or junk disposal, you can depend on us for prompt and timely pick up. If you’re ordering a garbage bin, you can be sure of precise delivery and pickup schedules, and you can be equally sure that the bin is “driveway friendly” (no damage to the driveway). We do the utmost to satisfy our customers and to ensure maximum value, regardless of the job size. With satisfied customers, comes customer referrals – and that’s what we want. At Gold Disposal, we believe in an environment-friendly approach. We engage in responsible disposal, wherever possible, and do our best to allocate and dispose of the waste we collect. Whatever we collect, whether its electronics, appliances, drywall or construction debris, we are aware of disposing responsibly. The truth is, we’re always trying to improve performance, both for the benefit of our customers and the environment. As for customer service, the work teams at Gold Disposal are experienced in their work, and professional in their performance. 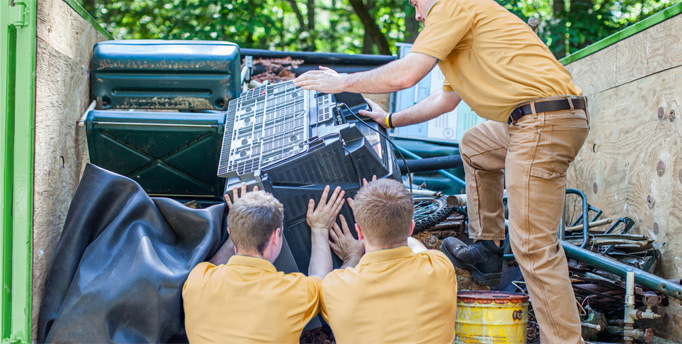 Our delivery trucks and garbage bins are always in good repair and condition, and our employees respect every customer’s property and possessions. Our people are knowledgeable in waste and junk disposal, and can offer practical options and workable solutions when unique situations present themselves. At Gold Disposal, there’s a solution for every kind of waste, garbage, scrap or junk. Customers can choose from select services or something more all-inclusive. Our work teams can do it all for you, or we can offer individual bin/dumpster rentals - but you can always be certain of reliable service and a hassle-free experience. Whether you’re a homebuilder, a contractor, a gardener, or a homeowner, we’ve got a service solution for you. The team at Gold Disposal understands the waste disposal business. We’ll let you know what materials can be dumped legally, and what cannot. We’ll explain the nuances of hazardous waste materials. We’ll clarify the regulations on “maximum load height”. And we’ll explain all about weight limitations. Quite simply, we offer you an approach that is straightforward, and without surprises. You’ll be in good hands when you deal with the staff at Gold Disposal.